The month of August (my birthday month!) has been wonderful so far! It's been lovely getting to celebrate in all sorts of ways with all my favorite people, and I couldn't ask for anything more. I'm excited to see what the last few weeks of summer will bring my way. Hopefully, it's more adventures! Rachel shares how she consolidated her tools for organization. I actually use Wunderlist, Google Docs and my handwritten planner most, but it fascinates me to learn how others organize their stuff. Lili talks about the differences between blogging as a professional versus blogging as a hobby. It's really interesting to see how there are more standards and requirements to follow if you're doing it professionally. Since this is a personal blog, I'm the one who sets my own rules. Hazel blogs about her week offline from social media. It's interesting to think about plugged in we all are these days. In many ways, it's nice because you can chat constantly and share what's going regularly with people all over the world. But it can also be distracting from real life if you allow it to be. Josephine talks about bookstagram and things that can be done to improve that community. I'm not officially a bookstagrammer, though I enjoy sharing photos of my books most of the time! I do think that a lot of the issues that Josephine brings up are things that even I notice, and really bother me as well. Hopefully, as with any community, it will only get better from here. Mishma shares what she thinks would make for an awesome villain. Personally, I'm with Mishma, I like my villains to be well-written, and just as interesting and complex as the heroes, and the elements she's shared make so much sense to me. Hi, my name is Alexa and thanks to my friend Hannah, I'm making compulsive wishlists of the titles I want from Folio Society. Hannah does us all a solid and talks about her obsession with their books, full details and photos included! 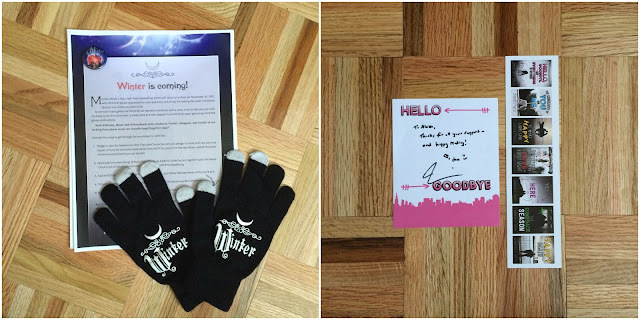 I've gotten some swag over the past two weeks that I'm super excited about - a pin, a pair of gloves and excerpt from Winter, and a signed bookplate and bookmark that are part of Jen's pre-order deal for Hello, Goodbye and Everything in Between. I also got this great assortment of stationery from my friend Steph! I can't wait to use these to send happy mail to friends and family! I can't wait to read Brown Eyed Girl. I love Lisa Kleypas, and very excited to read Joe's book. I just noticed my post on here and ahhh! You are too sweet for including it! Thank you! It is totally interesting to me that so many rules can be part of a blog. It makes me curious how a group blog would compare to blogging professionally because I'm assuming group blogs do have more reals since it's not run by a single person. I too am a Folio Society ADDICT. 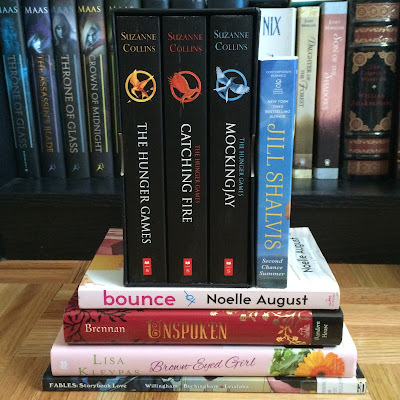 My best friend gave me a giftcard for my birthday and I'm still debating which book to put it towards. I want the His Dark Materials series more than anything but it's SO expensive that it's hard to justify. I hope you enjoy all of your new books, friend!